Small kitchen designs..... just because your kitchen is smaller than someone else's walk-in closet, it doesn't mean that it can't be an efficient and hardworking space. Space is a very valuable commodity and to make the most of your small kitchen, it is important that you maximise the space and utilise it to it's full potential. So, lets see what clever design tricks we can come up with to implement during your small kitchen design. Just as in any other home, even a small kitchen still forms the centre of your home and is an important part of your living space. With the ever increasing cost of building materials, new homes are becoming more and more compact, and the rooms smaller and smaller. As a result, it is important to plan your small kitchen layout with more care. One of the most important things to do is to go open plan. That radically changes the perceived space that is available. 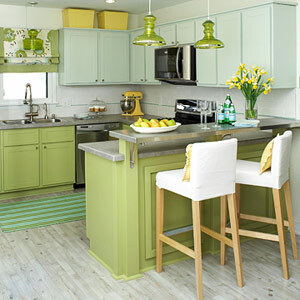 Colour is one of the simplest and most effective tools to change the look of a small kitchen. If used to good effect, the right combination of colour, texture and pattern can dramatically transform even the smallest kitchen to look spacious and cosy. The secret to creating a stylish kitchen, is in choosing just the right depth of colour for the effect that you want to create. Look at the beautiful effect the colours create in this home to draw your eyes from the kitchen to the depth of the living area in order to create a perception of space. 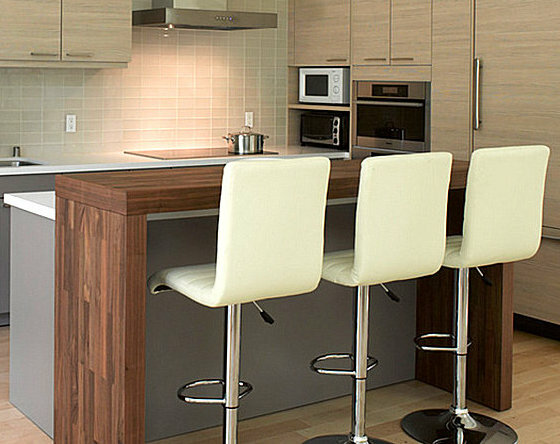 How to go about small kitchen designs depend on the resources and space available to you. 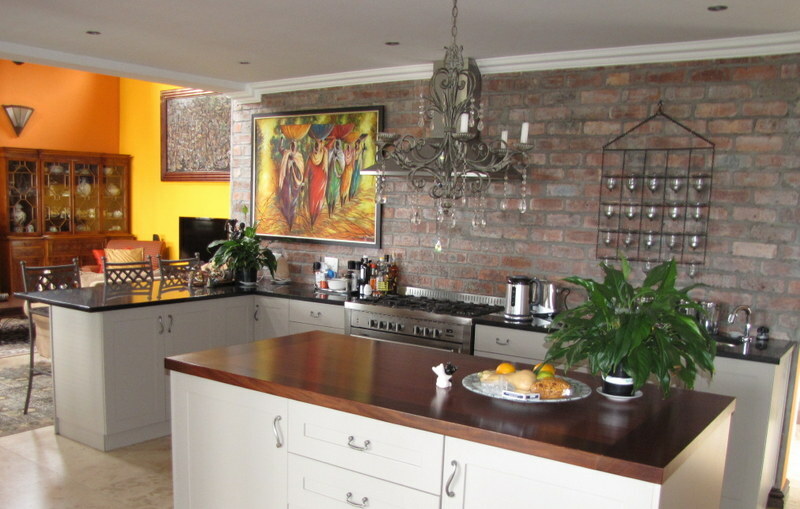 Creative planning and smart small kitchen designs deliver just as much function and pleasure as a bigger kitchen. By making the most of the kitchen space available, and by utilising the spaces around the kitchen, you can create a beautiful, practical and functional small kitchen. The key is to not cram too much stuff into the little space you have. Eliminate clutter. The less clutter, the bigger the kitchen will feel. If at all possible, use a cupboard elsewhere in the home as a small pantry. A separate pantry is an enormous space-saver in a kitchen. Make sure that it is cool, dark and well ventilated, close enough to the kitchen, and that it has plenty of shelving. Minimise the amount of stuff you keep in the kitchen. Small appliances can be stored in the cellar or garage when not is use. Cleaning products can be stored under the stairs. Fit only the essentials - a stove, a sink, a fridge - and then use clever ways to incorporate everything else you need. Keep things simple and open. To create the illusion of more space, reduce the number of visual elements by using simple cabinet styles. If you have the skills, install the cabinetry yourself. This is an enormous cost saver. Then you will have more money available to fit that special counter top you always wanted, like stone, granite or composite work tops. These will have to be installed professionally though. Save by painting your own units. Use a durable finish, like eggshell, and sand the surface lightly between coats. I have seen amazing finishes in small kitchens where the owner did everthing himself. The more coats you apply, the more durable and professional the finish will look and feel. Use light colours to give the impression of space. Do not use too many colours. Restrict your palette to three colours maximum. Look for smaller than standard kitchen appliances. This also helps to trick the brain into thinking that the space in which the appliances are fitted is bigger than what it really is. Nowadays one can find anything from a mini dishwasher to a two plate stove online. Every successful small kitchen design begins with a good understanding of what works and what doesn't. Because you have less space available, look at each specific part of your kitchen, from cabinets, appliances, the floor, lighting and finishes, and then consider how it should all work together. This process helps you to prioritise and figure out which things you really must have and which things you can live without. The most important thing to remember is that you must feel at home in your kitchen. If the space works and you can cook with ease, and you like to spend time in your kitchen, you have achieved more than most.